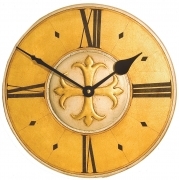 This definitive collection of handmade, decorative wall clocks takes it's inspiration from the major European decorative art movements. Styles range from the Gothic through to the Art Deco. Every detail, curve and flourish has been painstakingly designed and then lovingly fashioned and finished with all the precision and exacting skill and attention expected of a craftsman. The end result of this exacting process of refinement is a collection of decorative wall clocks second to none in terms of their design, styling and finishing. 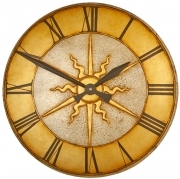 Simply click on the decorative wall clock you are interested in below to see the full detail. As a handmade artifact we can offer you exactly what you require. 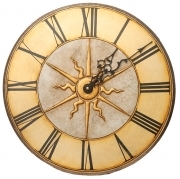 Whether you're looking for a pendulum or mantle clock we are confident we'll be able to offer you the right, style, quality, size and finish of your choice. 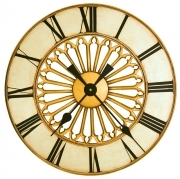 To enhance the styling our decorative clocks are hand finished in either a traditional gilded finish or one of our paint finishes -for a more contemporary look. Decorative Paint and Leaf Finishes. Combining gilding with paint finishes creates a synergy where by the two enhance each other. It can also be used to break up large expanse of gold or silver leaf which can be a bit too over powering or to pick out details and subtly accentuate the shape of a time piece. The simplest and quickest option is to choose an artifact from one of our existing collections. If you require a specific size or finish there is a second option which enables you to customiseone of our existing artifacts. For the ultimate in exclusivity and customisation you can opt for our bespoke clock or mirror service and get the artefact of your dreams.